My husband has been collecting old coins since he was little, he kept those coins for years and years. It's so amazing how each coin's value at this time differ from the original amount. You can even get 3 dollars for each dime depends on its condition. As we are browsing online we saw a collectible coins. This United States Mint Silver Proof Set has never been touched by human hand, sealed in a transparent box. 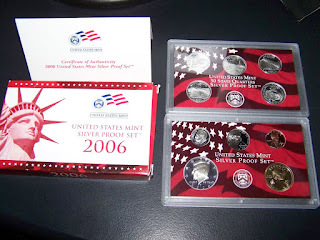 It has a Certificate of Authenticity 2006 United States Mint Silver Proof Set. We bought this set for Jarred the year when he was born. Check out the pictures I posted here. 1 comments on "United States Mint Silver Proof Set"
Keep up the excellent work! United States Mint Silver Proof Sets.